Dozer has made outstanding progress. His coat looks much better and the Demodex mange is resolved, and conservative treatment of his hips and hind legs with supplements and anti-inflammatory medicine has made him much more comfortable. But the most fantastic news is Dozer has a new home! Kaitlyn adopted him this month. “I saw Dozer on the Animal League America Instagram page, read his story, and wanted him instantly,” says Kaitlyn. She showed Dozer’s photo to her boyfriend and he felt the same way. He told her “Let’s do it!” They filled out the application to be Dozer’s new parents, and after a thorough review they got the happy news, and a new family was made! 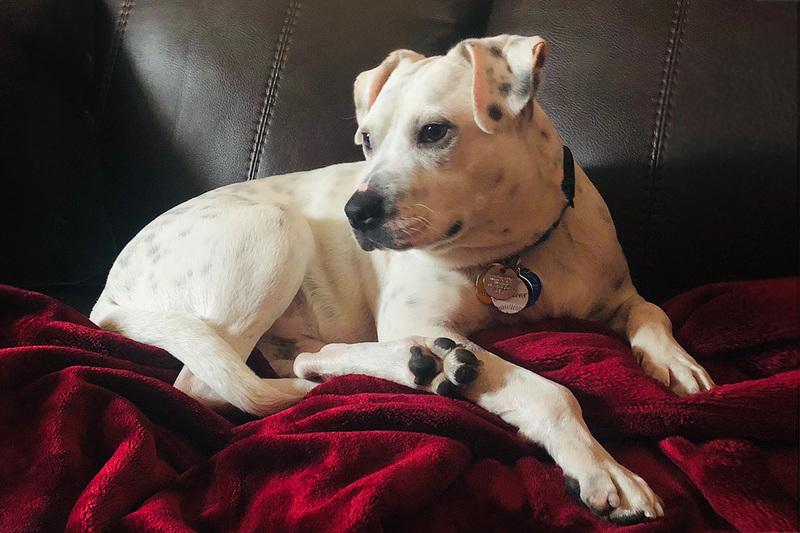 He was shy with us at first, but now he “is a cuddle monster and constantly wants to be wherever we are….Overall, he’s just an amazing dog and we couldn’t be happier to have him as a part of our family,” says Kaitlyn. This new beginning was made possible thanks to the support of our Help Me Heal Program. Please continue to support this vital program and make more new beginnings possible for animals in need. Update, November 1, 2018: Dozer is on the mend. 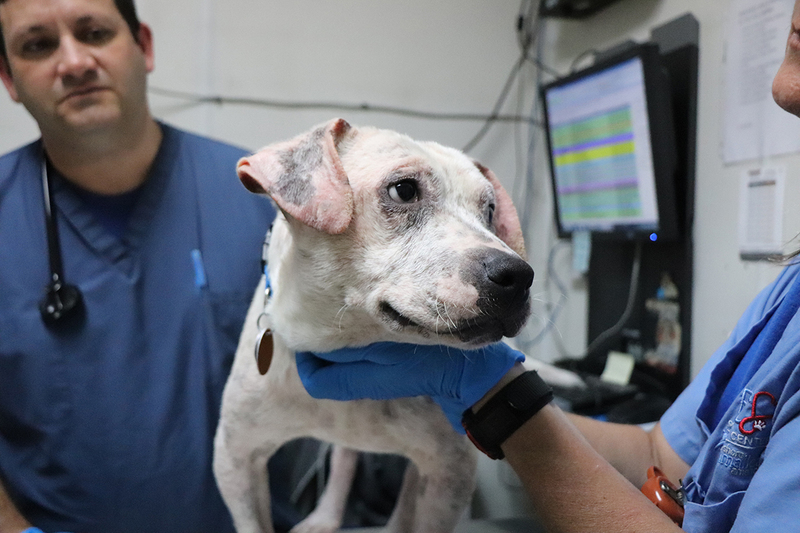 Thanks to the support of our generous donors, Dozer is making a speedy recovery under the care of the veterinary team inside our Pet Health Centers. The once infected and damaged coat of the young Pittie mix is healing nicely, and his peppy, friendly personality continues to make him a favorite around our no-kill campus. 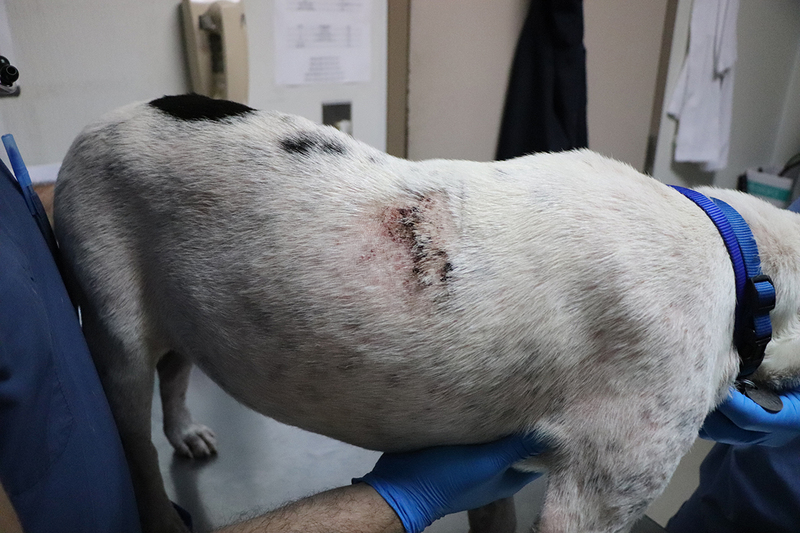 Although Dozer is still dealing with orthopedic issues in his hips and hind legs, Dr. Gerard Laheney, Animal League America Veterinarian, is hopeful that supplements and pain management medications will provide relief for the recuperating dog. 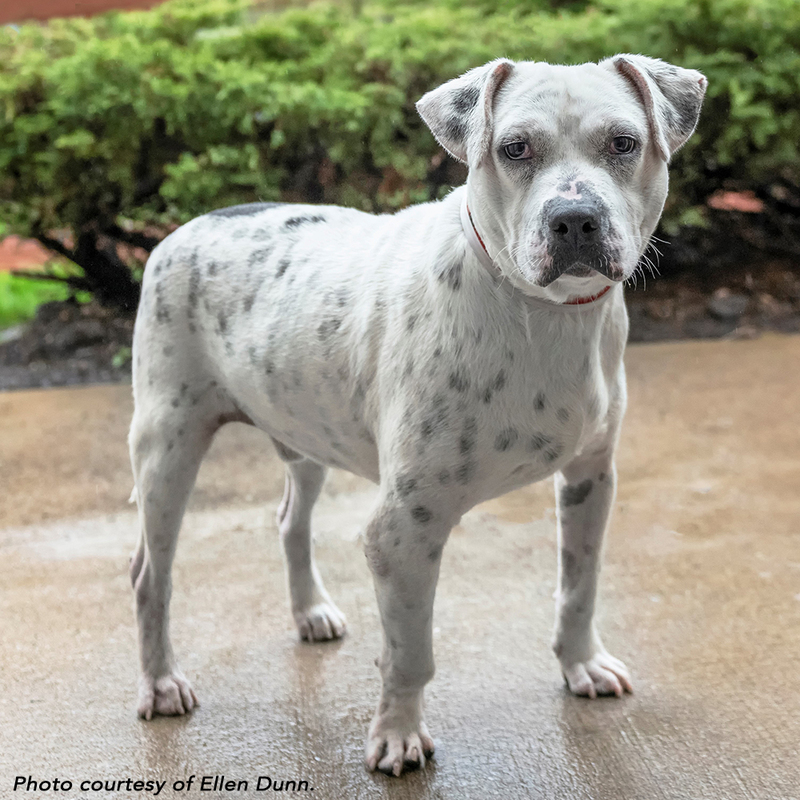 For now, Dozer remains in the care of the nurturing medical team inside our Pet Health Centers, but will soon find himself available for adoption. 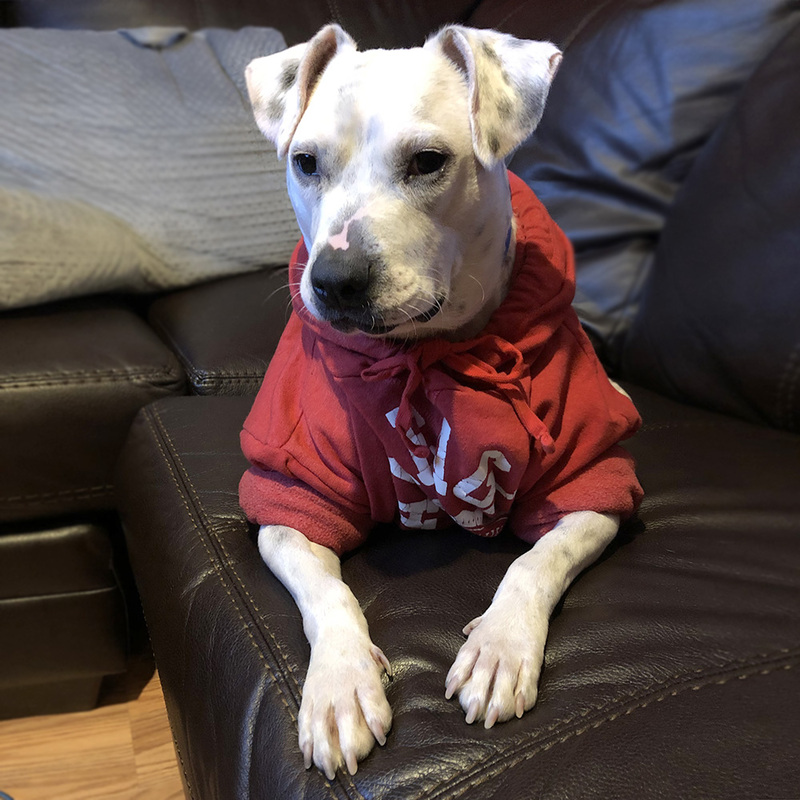 Regardless of his future diagnosis, we will be there to ensure he receives everything he needs to make a complete recovery and eventually help him find a responsible, loving home to call his own. If you would like to meet Dozer, and possibly make him part of your loving family, please contact Andrew Mulvey at [email protected] or call 516-883-7900, ext. 850. As part of our relief efforts to aid the people and animals in the Carolinas left suffering in the wake of Hurricane Florence, our Emergency Rescue Team collaborated with Orangeburg SPCA in South Carolina to save the lives of another 53 homeless dogs, cats, puppies, and kittens, all of which would have likely perished scared and alone, outside in the harsh conditions, if not for this lifesaving rescue mission. One of the dogs on this rescue transport was a young Pittie mix named Dozer. 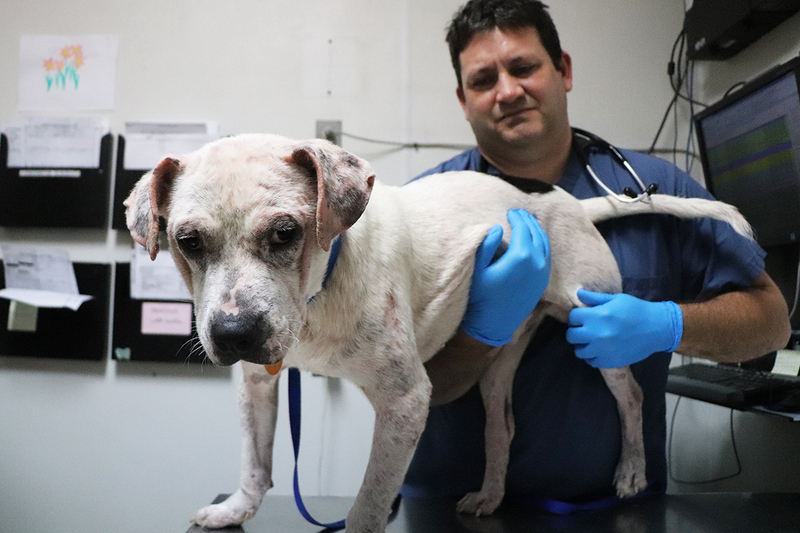 Although his tender personality gave the appearance of a happy, healthy dog, it was obvious by his patchy coat of brittle white fur, irritated skin, and the open wounds on his back, legs and head, that Dozer was suffering. 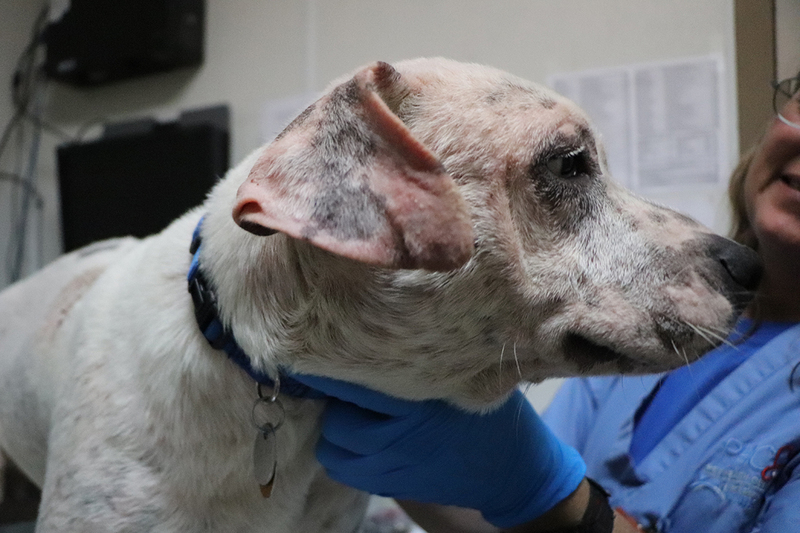 After his initial examination inside our Pet Health Centers, our veterinary staff diagnosed Dozer with several issues, including a severe case of demodectic mange – an inflammatory skin disease caused by microscopic mites. 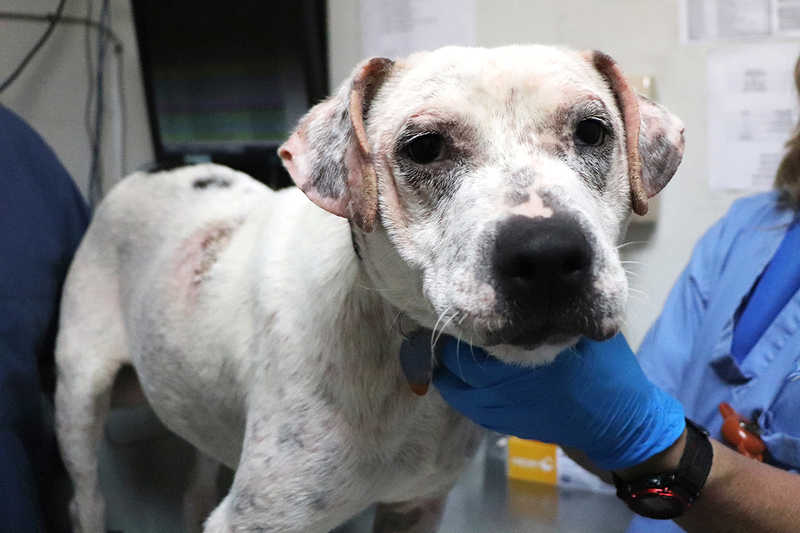 Your donation today can help Dozer and other abandoned, injured, and neglected animals get the lifesaving care they need – and the compassion they deserve. Further into the examination, Doctor Laheney also noticed that Dozer’s posture was off. A thorough check of his hind legs quickly gave him the answers he was looking for. 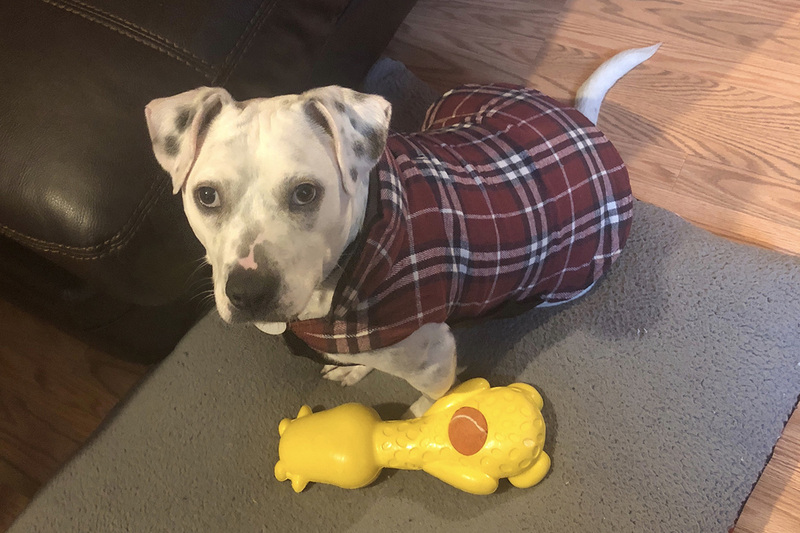 Dozer was suffering from luxating patellas in both knees – a condition in which the kneecap dislocates or moves from its normal location and often causes lameness, weakness, and pain. 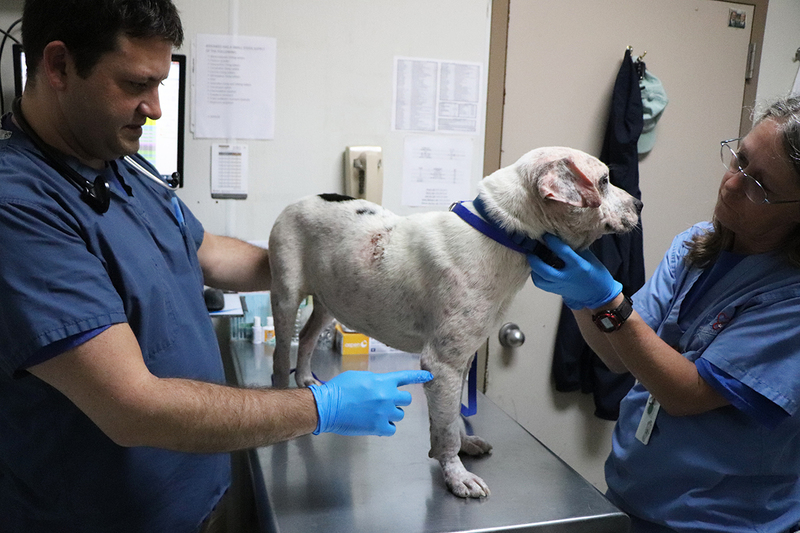 Doctor Laheney and the rest of the veterinary team will know more about the severity of Dozer’s leg issues after x-rays, but for now he said they are focused on repairing his coat and easing the pain caused by the demodectic mange. After a more complete examination, Dozer was also found to be completely deaf. 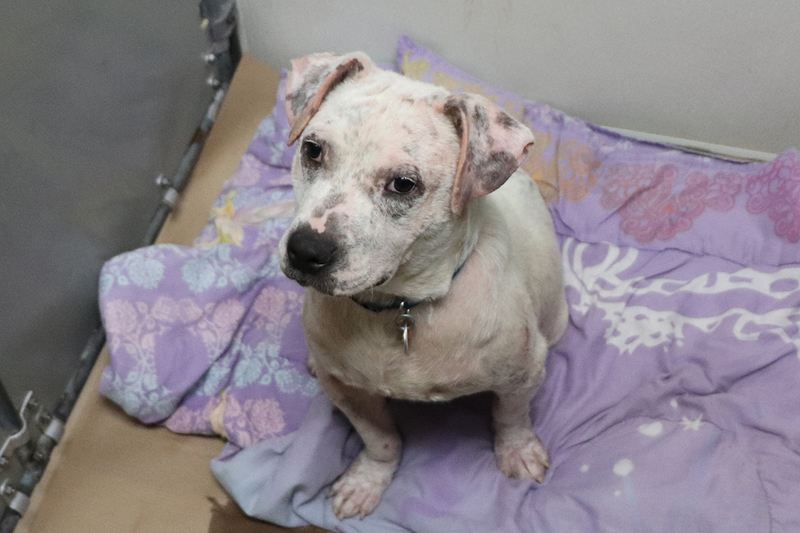 Thanks to our Help Me Heal Program, Dozer is now out of harm’s way and in the nurturing arms of the world’s largest no-kill rescue and adoption organization. Because of loyal donors like you, he will receive the medical care he needs to recover and hopefully go on to live a happy, healthy life with a family who adores him. Please donate today and help other animals just like Dozer who need the same type of lifesaving individualized care. Your donation today can help sick, injured, and neglected animals get the lifesaving care they need – and the compassion they deserve.